(yawwwwwwwwwnnnnnn) Ah, sorry. That was rude. Gosh, being a real working person is exhausting. Despite how much I miss wearing soft pants everyday and binge watching Riverdale, I'm oddly happy to be back to work. I get a sort of high when I'm busy and buzzing around being productive. It feels good to conquer things again actually use some critical thinking skills! I'm sure that this weird appreciation for work will eventual wear off after my eyes hurt from reviewing construction drawings and organizing material samples. On the positive side, I have a bunch of really cool projects coming up this year! Did I tell you I'm designing a food truck?? Sort of. But I'll share more about that later. Should we talk about salad now? I know it is pretty basic to post a salad as the first recipe of the new year, but why not start out on a healthy note before we digress into dumplings, pizza, and cupcakes? I'm going to be super honest with you, because we're friends. I'm not a huge fan of salads... well actually, I'm just really particular about salad... wait no! I have extremely high standards for salads. Yes, that sounds better. There is nothing sadder than a limp and boring salad. One of my biggest pet peeves is ordering a sandwich at a cafe and getting a side of some spring mix with a balsamic vinaigrette. That is just not going to cut it for me. 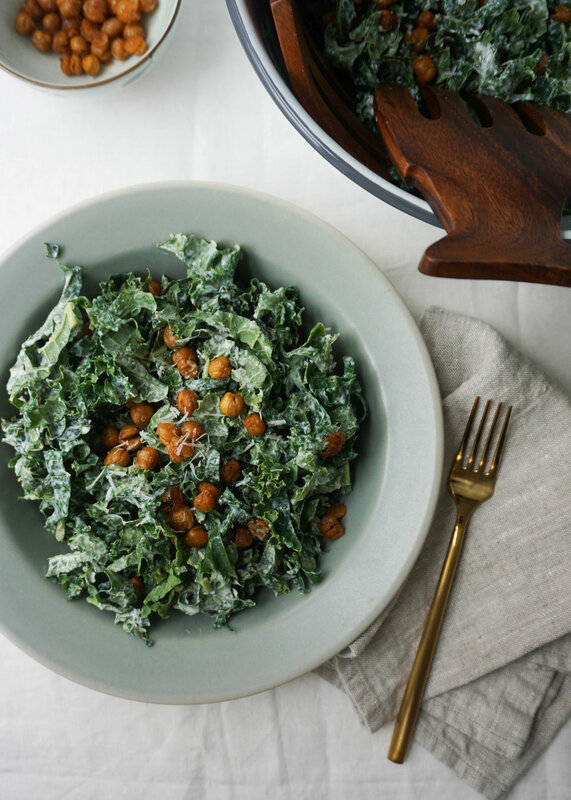 This simple kale salad gets a big check mark on all three! 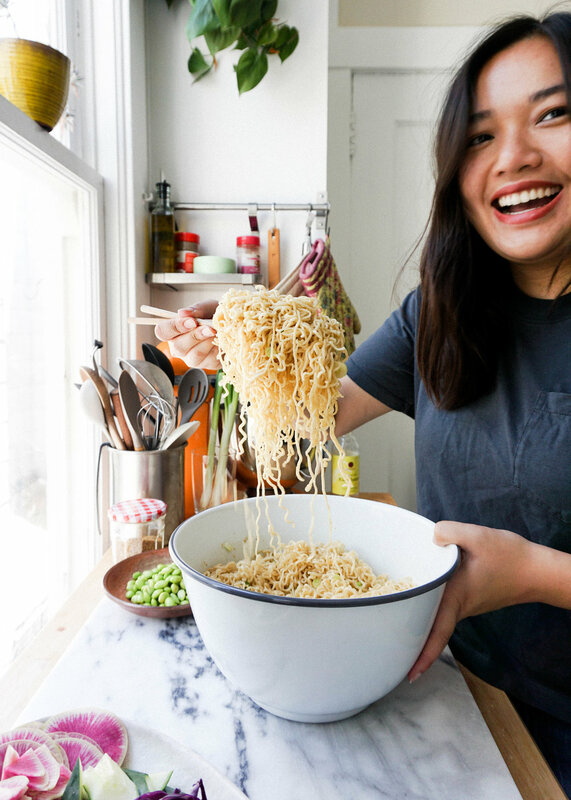 A lot of times, I like to pile on the ingredients. Eggs. Apples. Bagel Croutons. Salty meat. Berries. Avocado. Nuts. But since we are just starting off the year and easing back into our normal routines, simple seemed best! I would eat anything if it was covered in ranch dressing. Even the dreaded celery stick or maybe even a beet! 😝 To help us feel better about drowning our food in ranch dressing, I made a healthier greek yogurt ranch dressing! This dressing is tangy, salty, packed full of herbs, and slightly spicy from cayenne. It's so good, I might never need to reach for the Hidden Valley ever again. That takes care of a flavorful dressing. Up next is the crunch. 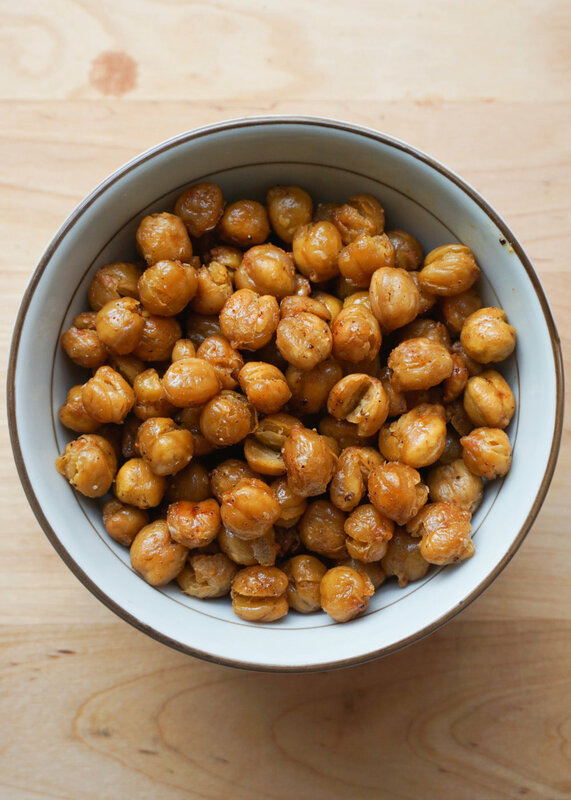 These chickpeas are addictively crunchy, salty, smokey, and spicy. I literally could have ate the entire tray of chickpeas. The perfect snack and topping to add some much needed texture to your salad. If you are really into chickpeas or want some extra to snack on, go on and double the recipe! You won't regret it. Greens like kale, chard, or collard greens are my go to when fixing a salad. I'm not really into spring mix or that iceberg/olive garden salad stuff. If I'm going to eat a salad, I want it to really count. It should feel like I'm eating an actual vegetable! Plus I love the chew and heartiness of darker greens. Happy salad making and resolution keeping! Don't forget to check your teeth for stray green bits in the mirror afterwards. Also, don't worry. There's going to be less salads and more dumplings and cakes in the near future! Preheat your oven to 400 degrees. Drain and towel dry the chickpeas. Add them to a baking sheet and toss with olive oil, smoked paprika, cayenne, salt, and a few good turns of black pepper. Roast in the oven for 40 minutes, tossing half way through, until they are nice and crispy! In a medium bowl, whisk together greek yogurt, white vinegar, garlic, parsley, chives, dill, salt, black pepper, water, and cayenne. Adjust seasonings to personal taste and add more water if you like your dressing thinner. Place in a airtight container and allow to chill for at least 30 minutes. De-stem the kale and cut into small bite sized pieces or ribbons. Wash and dry the kale. Massage the kale for a few minutes until tender. 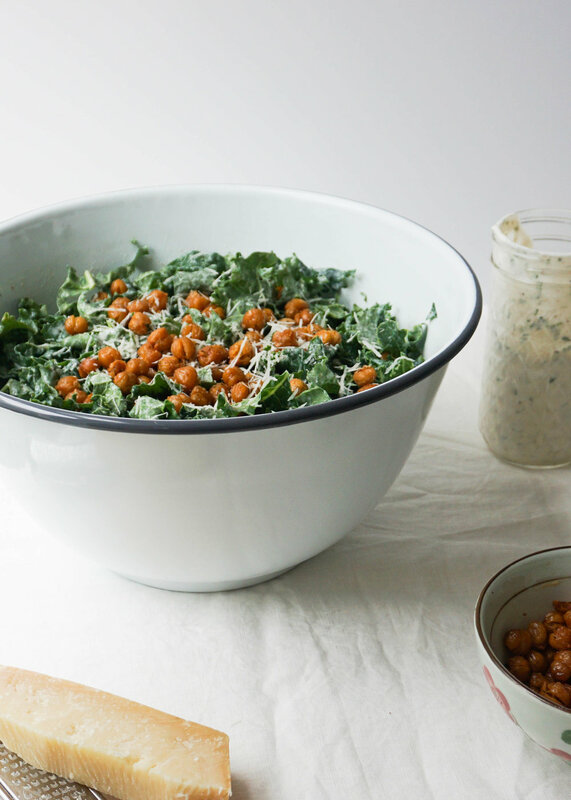 Toss with yogurt ranch dressing, pile on the chickpeas, and shower with an appropriate amount of parmesan cheese.